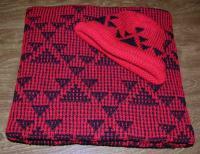 Our unique hand loomed baby blankets and caps make great gifts for any baby. Getting the set can save you money too! 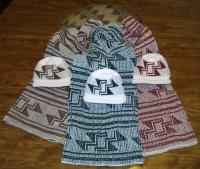 Native American Baby Sets are all Custom Knit so you can select your own colors. 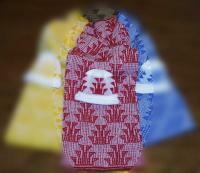 Designs are offered in acrylic. 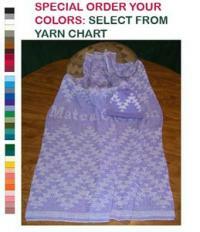 The yarn was chosen because of its soft qualities especially after washing, it is even softer. 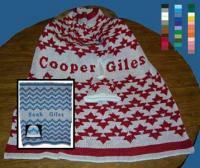 Babies love to be cuddled in the warmth of this knit. The tuck stitch used to create this knit item is lofty and airy. 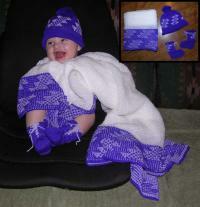 This creates the warmth needed, but not the heavy weight! Newborn Baby Size Caps measure approximately 15" in diameter. 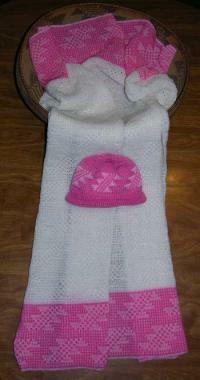 The Newborn booties are 4" in foot length. The 6 month cap size measures 17" in diameter, which will stretch to fit to 12 months. The 6 Month bootie measures 5" in foot length. 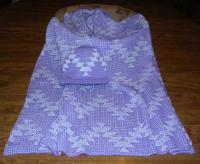 The blankets come in two sizes: all over pattern receiving are 34" x 34" and the edge blankets are 34" x 44".